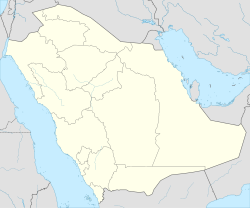 Tayma /ˈtaɪmə/ (Arabic: تيماء‎) or Tema /ˈtiːmə/ Teman/Tyeman/Yeman (Habakkuk 3:3)‹ is a large oasis with a long history of settlement, located in northwestern Saudi Arabia at the point where the trade route between Yathrib (Medina) and Dumah (al-Jawf) begins to cross the Nefud desert. Tayma is located 264 km southeast of the city of Tabouk, and about 400 km north of Medina. It locates in the western part of An Nafud desert. Recent archaeological discoveries show that Tayma has been inhabited since the Bronze Age. In 2010, the Saudi Commission for Tourism and Antiquities announced the discovery of a rock near Tayma bearing an inscription of Egyptian pharaoh Ramesses III. This was the first confirmed find of a hieroglyphic inscription on Saudi soil. Based on this discovery, researchers have hypothesized that Tayma was part of an important land route between the Red Sea coast of the Arabian Peninsula and the Nile Valley. The oldest mention of the oasis city appears as "Tiamat" in Assyrian inscriptions dating as far back as the 8th century BC. The oasis developed into a prosperous city, rich in water wells and handsome buildings. Tiglath-pileser III received tribute from Tayma, and Sennacherib named one of Nineveh's gates as the Desert Gate, recording that "the gifts of the Sumu'anite and the Teymeite enter through it." It was rich and proud enough in the 7th century BC for Jeremiah to prophesy against it (Jeremiah 25:23). It was ruled then by a local Arab dynasty, known as the Qedarites. The names of two 8th-century BC queens, Shamsi and Zabibei, are recorded. For part of his reign, Babylonian king Nabonidus retired to Tayma for worship and looking for prophecies, entrusting the kingship of Babylon to his son, Belshazzar. Cuneiform inscriptions possibly dating from the 6th century BC have been recovered from Tayma. It is mentioned several times in the Old Testament. The biblical eponym is apparently Tema, one of the sons of Ishmael. As late as the 6th century AD, Tayma was the home of the wealthy Jew, Samau’al ibn ‘Ādiyā. Tayma and neighboring Khaybar were visited by Benjamin of Tudela some time around 1170 who claims that the city was governed by a Jewish prince. Benjamin was a Jew from Tudela in Spain. He travelled to Persia and Arabia in the 12th century. The residence of the Babylonian king Nabonidus in the mid-6th century BCE. In Tayma, there is a desert climate. Most rain falls in the winter. The Köppen-Geiger climate classification is BWh. The average annual temperature in Tayma is 21.8 °C (71.2 °F). About 65 mm (2.56 in) of precipitation falls annually. Stele with dedicatory Aramaic inscription to the god Salm. Sandstone, 5th century BC. Found in Tayma by Charles Huber in 1884. Now in the Louvre. The site was first investigated and mapped by Charles M. Doughty in 1877. The Tayma stele discovered by Charles Huber in 1883, now at the Louvre, lists the gods of Tayma in the 6th century BC: Ṣalm of Maḥram and Shingala and Ashira. This Ashira may be Athirat/Asherah. Historically, Tayma is known for growing dates. The oasis also has produced rock salt, which was distributed throughout Arabia. Tayma also mined alum, which was processed and used for the care of camels. Qasr Al-Ablaq castle is located on the southwest side of the city. It was built by Jewish poet and warrior Samuel ibn 'Adiya and his grandfather 'Adiya in the 6th century AD. The Qasr Al-Hamra palace was built in the 7th century BC. Tayma has an archaeologically significant perimeter wall built around 3 sides of the old city in the 6th century BC. Many museums. Although Tayma has museums of its own such as the "Tayma Museum of Archaeology and Ethnography", many artifacts from its history have been spread to other museums. Early finds such as the "Tayma Stele" are at the Louvre in Paris among others while large museums of national importance in Saudi Arabia, such as the National Museum of Saudi Arabia in Riyadh and the Jeddah Regional Museum of Archaeology and Ethnography also have significant collections of items from or related to ancient Tayma. ^ Josephus. The Jewish War. Translated by Whiston, William. 1.1.5 – via PACE: Project on Ancient Cultural Engagement. Greek: Ἀράβων τε τοὺς πορρωτάτω = Preface to Josephus' De Bello Judaico, paragraph 2, “the remotest Arabians” (lit. “the Arabian [Jews] that are further on”). ^ "Tayma - Arabian Rock Art Heritage". Retrieved 2019-02-10.